Du er her: Start / Sneum Å is ready! Location – Sneum Å at the Allerup bridge. Bait: ground bait with frozen red maggot and frozen Joker. It was very windy and blowing down the river so the going was quite hard , I used an over shotted 8g cralusso torpedo. The fish came in very steady for the first two and a half hours and were nearly all good sized roach, in great condition. The Bream haven’t showed yet but according to the locals they hold up in a deeper pool further up river and it isn’t warm enough for them to come down river yet. 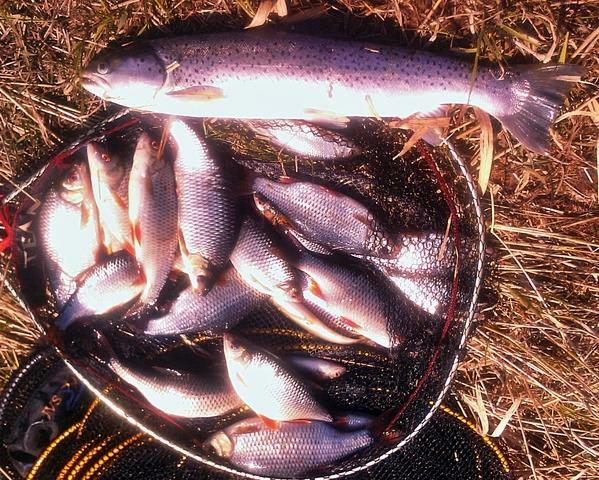 Total catch including the trout was approx 12 kg.. not bad to say I thought it was still too cold for this stretch. http://medesiden.dk/wp-content/uploads/2017/05/18641471_10155217491636702_604620894_o-300x131.jpg 0 0 Casper Kærgaard http://medesiden.dk/wp-content/uploads/2017/05/18641471_10155217491636702_604620894_o-300x131.jpg Casper Kærgaard2010-04-12 04:58:252017-02-19 14:40:25Sneum Å is ready! Weekend tur ved Viborg Søerne. Tillykke med Hav ørreden! Jeg må i gang med at fiske det stykke af Sneum Å så jeg kan få nået træning i strømvand.